Acton The Good Old Days - a Memory of Acton. 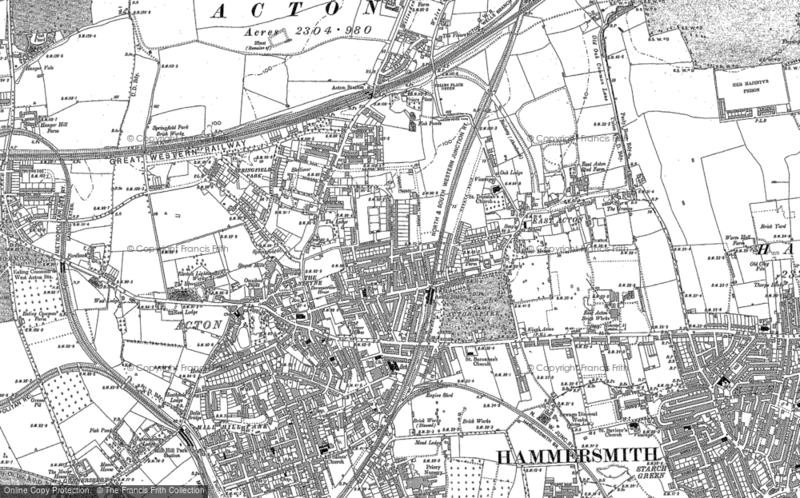 We moved down to Acton from Stafford in the midlands in 1949 when I was 4 years old. We were given a flat in The Vale, my first school was East Acton infants up East Acton lane, a cracking little school. I was very happy there until they moved me to East Acton House close to Bromyard Avenue. Oh happy days there, the sun always shone or so it seemed, not so when I went to my next school, John Perryn, I didn't like it there. The headmaster used to shout all the time. and it was further to walk to get there, not good, I couldn't wait to leave, it still gives me the shudders to this day to think of it. After that I went to Bromyard Avenue School, much better, it was closer for a start, and I could go home for lunch, not that I ever did. I liked school meals. The school was new when I first went there, very modern, very posh, which is more than I can say for John Perryn School. In the summer holidays we used to go over to Acton Park, when I say we I mean me and a couple of mates, Frank Warren, Ray Bradley, Kieth Crawford, playing football all day every day, great times. Now It's 1960, the rock & roll years. I left school and started my own R&R band, we used to practice above a cycle shop called Collett's which was owned by Jack and Reg Collett, it was on the parade oposite The Vale flats. The flats were good for talent, Adam Faith lived there, Caren Gardener the actress, Ginina Fayeh another actress who played the little girl in 'The Day of The Triffids', the first Milky Bar Kid, I can't remember his name. Later on Collett's was turned into a studio by Ginger Baker, the drummer with the band 'Cream'. Acton was a hive for talent. 'The Who' was another band that did well. There aren't many towns that can boast of such talent. Yes if you lived in Acton in the1950ss & 1960s you were very fortunate, look at it now ,a mere shell of what it used to be. As for me, I moved back to Stafford, much nicer. A memory shared by Roger Brown on Aug 6th, 2010. Send Roger Brown a message. I remember john Perrin school ,East Acton house,and then Bromyard avenue school,we used to live in church field rd then moved to East Acton lane just in time for secondary school .On leaving school I went into a hairdressing apprentership in a salon near the Odeon cinema ,I remember Greens the bakers ,then the salon (Jacques)moved to nearer the vale I have great memories of my time in Acton,got married at St Aidens R/C church in East Acton (single name Beddows)love to hear from anyone who knew me then . Add a memory of Acton.